Monster Quality Cables Enhance Speaker Performance!!! Your speakers are the final link in the audio chain. Many people consider them to be the most critical components in their stereo or home theatre systems. Their clarity and ability to accurately recreate music and film soundtracks will ultimately determine how good your system sounds. The quality and design of your audio cables play a key role in accurately delivering the full power and depth of the music signal from your music source to your speakers. Monster Standard Cables Offer Unsurpassed Performance!!! Our lowest cost standard construction speaker cable is a general purpose cable recommended for small speakers and single-brand rack systems, as well as custom home installations or professional sound reinforcement where cost is an important consideration. Monster Standard provides a quality connection and offers special features including fine high-purity copper standings for an ultra flexible construction that maker installation easy. The cable's Duraflex protective jacket is UV stabilized and resistant to temperature extremes, household chemicals and abrasion. Higher quality manufacturing results in a speaker cable that improves power transfer for increased dynamic range. Monster Standard Cable Offers Performance and Affordability!!! Whether you are a music lover or a home theatre enthusiast building your first system, Monster Standard will deliver the performance you demand and allow your system to reproduce your favorite music to its fullest potential when price is an important consideration. While it may seem nearly impossible to fully achieve the goal of reproducing the sound of live music in your home, Monster Standard speaker cable will bring you one step closer to re-creating the live musical or movie theatre event with the fidelity and realism the performers and engineers intended. 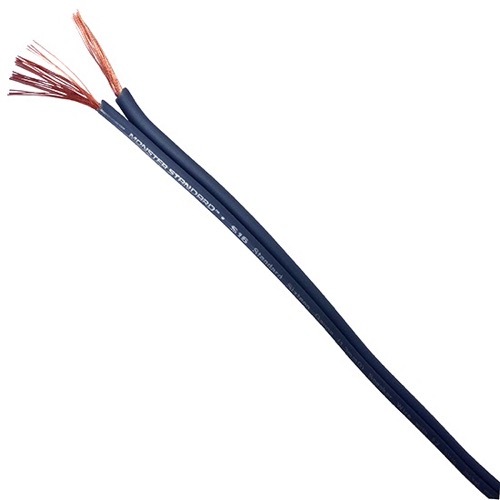 Fine-stranded copper conductor for high integrity signal transfer. Heavy-duty Duraflex jacket resists abrasion, increases flexibility.